Wednesday Lunch Bunch Bible Study - Join the Rev. 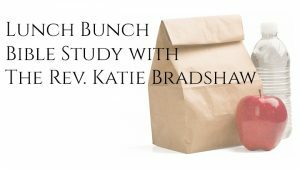 Canon Katie Bradshaw for lunch and Bible study on Wednesdays, Noon – 1:00 p.m., in the Whole Foods Community Room (located upstairs at Whole Foods: 4500 Interstate 55 North Frontage Rd, Jackson, MS 39211). 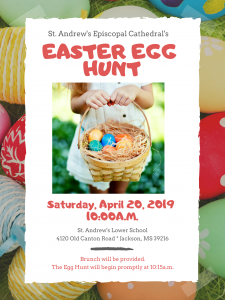 Are you considering being confirmed or received into the Episcopal Church? Are you simply interested in knowing more about the Episcopal Church? Please join the Rev. Canon Katie Bradshaw on Friday, May 3, 6 p.m. - 9 p.m., and Saturday, May 4, 9 a.m. - 2 p.m. for a weekend of discovery about the Episcopal Church. R.S.V.P. to kbradshaw@standrews.ms.